They used as many green building materials as they could, and the silver silo-looking things are water collection tanks. Inside the building they have a few high powered telescopes so you can really see the birds out on the lake. Rocking chairs on the back porch offer a nice space to sit and reflect on nature. These are the only three swans that we saw. Apparently the others all normally take off by Valentine's Day. Shoot! We will have to remember to go back earlier next year. We saw lots of other birds though, so that was pretty cool. And then we spied these eagles, a momma and a juvenile we think. We watched as they flew, landed on the ice, and baby caught a fish while momma watched. We were planning to visit the Lincoln Shields Recreation Area nearby, until we saw this. We decided that would need to be the road not taken. Overall, a great day. I can't wait to go back in the spring and see the native landscape when it is blooming. And not so blooming cold! We decided to drive up to Iowa to visit my in-laws over President's weekend. 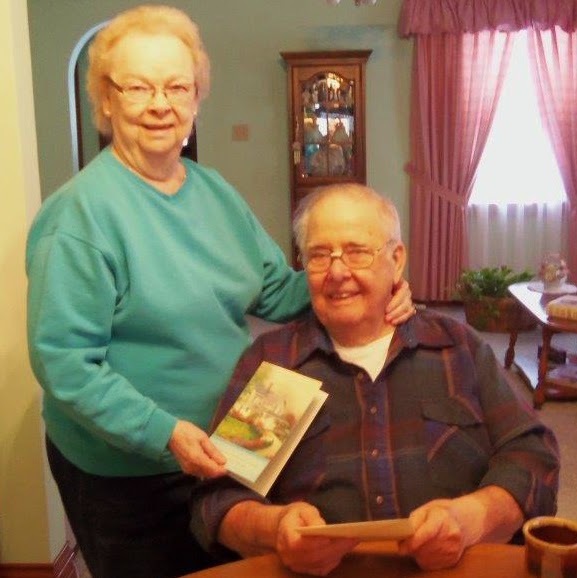 We didn't see them over the holidays and this would give us a chance to not only spend Valentine's Day with them, but also celebrate their 62nd wedding anniversary. At the time we made the decision there was no bad weather in the forecast. When we left St. Louis Friday morning there was a little bit of freezing rain. The further north we traveled, the worse the weather got. The windshield wiper fluid would not come out of the designated holes, and between the slush from the road and the sleet, we could barely see out of the windshield. We stopped at a gas station in Bowling Green to clean off the window and fill up the tank - just in case. When I went in to use the restroom I asked the women in there if any of them had come from the north. Another woman said they were traveling from St. Louis to Des Moines, but she thought they were going to turn around. The women at the cash registers said that Hannibal was a mess and Palmyra got 4 inches of snow. I told Jim I thought we should head back home. He called his dad, who said it was sunny and dry in Charles City. Jim wanted to try going a little further. I should admit here that I am not a good traveler under normal conditions. I prefer to drive rather than be the passenger. But I do not like to drive when the roads are icy. Jim took over the wheel, and I tried to keep my mouth shut. Everywhere I looked there were cars in the ditch. As we got close to Hannibal, it was as if they didn't own any snow plows in that area. It was horrible! To top it off, we stopped again to fill up and grab some food and when I walked the dog, I fell on the ice. Knee, hip, wrist and shoulder took the brunt of it. At least I didn't break anything! Once we got into Iowa, the road conditions improved. They were still snow packed, but at least the slow lane was halfway decent to travel on. A drive which normally takes us 6 hours was 7 and a half instead. Charles City already had over a foot of snow on the ground, but they got several more inches on Saturday. Luckily we had nowhere we needed to go. Sunday was cold but sunny. Then we saw the forecast for Monday, which is when we planned to come home. More snow was predicted so we decided to see what the morning brought. I was reading reports of freezing rain from St. Louis up through southern Iowa, and Charles City was expected to get another 4 inches of snow. This time we decided to stay put since it looked like Tuesday would be clear with a warming trend. We took advantage of the extra time to visit with relatives and play card games. Sure enough, the roads were excellent on Tuesday. We left 26 degree weather and pulled into a balmy 64 degrees St. Louis. Unbelievable. Now I remember why I say I won't travel this time of year. Last night I had the pleasure of presenting to one of the German Special Interest genealogy groups at their monthly meeting in Kirkwood. I was asked to discuss how to research the history of your (or an ancestor's) home, writing family history and publishing your book. A tall order, but I actually managed to make that happen in my hour long talk. It was great to have an opportunity to speak to genealogists because I was essentially preaching to the choir. They already are familiar with many of the records I was discussing, so that makes things a lot easier. I just encouraged them to look at the records in a different light. It also meant they had helpful suggestions to share with the group of 25 souls who braved the extreme cold to come to the meeting. An added bonus was that I was able to include the photos of my ancestor's home in Steinweiler, Germany along with the house history that had been prepared for me when I visited there in September. It was fun to have so many of my worlds come together in one place! Squirrel Busters! So far three squirrels have been caught, two of them in one trap, which is apparently a bit unusual. Apparently Slappy did not want to stay in the Wolterman condominium without Skippy. (Reference: the squirrels in Animaniacs.) When Squirrel Busters came to remove Slappy and Skippy on Monday, he added a second trap to the back of the house. I check the traps every time I go outside, and they were empty when I left to go work out at 8:50. By the time I returned home a little after 10:00, there was Secret Agent Squirrel in the trap in the back. As I was photographing it, Rocky the Flying Squirrel took a leap off the nearby roof, flying 7 feet before landing on the tree next to me! He may prove to be a little more elusive to capture. Hopefully he will take the bait, and climb in to see what Secret Agent was up to. After all, a squirrel is just a rat with a prettier coat.